These two World renown destinations should be on your "bucket list"
Kruger Park offers a wildlife experience that ranks with the best in Africa! Stay in a private game lodge in a Big 5 reserve. This 8 Day Tour does just that, with 3 days on SAfari and 6 open vehicle game drives you will get to see some amazing animals and two days at Victoria Falls to see the Falls and partake in the many activities at the Africa adventure Capital. This is an all year round tour. Meet at Johannesburg International Airport and a transfer to a hotel close to the airport. Time to relax and freshen up and get rest after your long flight. An afternoon half day tour to Johannesburg and Soweto can be arranged (optional). We will meet you at your hotel or guest house in Johannesburg at 6:00am then depart and travel east to Dullstroom and Lydenburg. After a refreshment break in Ohrigstad we then a drive along part of the panoramic route along the escarpment of the Drakensberg mountains, stopping the Blyde River Canyon to experience the breath-taking view. This magnificent canyon is the third largest canyon in the world. Continue down the spectacular Abel Erasmus Pass into the Lowveld, it is now only a forty minute drive to the Lodge, situated in a "Big Five” reserve which is part of Greater Kruger Park. After enjoying welcome “non-alcoholic” drink on arrival, time to settle into your room then enjoy a light lunch looking out over the reserve and a waterhole. Late afternoon is "safari time" Meet your ranger and board an open game tracking vehicle to explore the African Bush looking for some of the many species that make this area home. 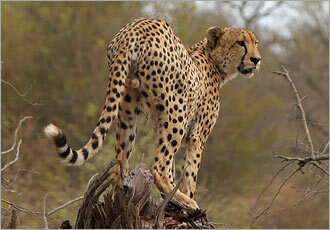 The ranger will point out and explain the many animals found, and hopefully you will be lucky enough to see some cats. 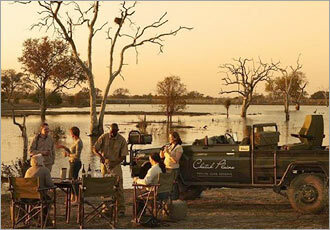 Just before sunset the ranger will stop and sundowner drinks accompanied with tasty snacks are enjoyed in the bush. The drive back to the lodge will be a night drive using spot lights to look for the elusive nocturnal animals. Once back at the lodge meet fellow guests at the bar area and dinner is served in a traditional "boma". Early morning wakeup call and a welcome cup of hot coffee before embarking on the 3 hour morning game drive with your ranger. Returning to the lodge for a hearty breakfast. After breakfast there is time to go on a game walk with your ranger or freshen up then enjoy the lodge surroundings. Escape the midday heat by spending time in or around the swimming pool or sit on you veranda, wait and see which animals or birds come to visit you or have a siesta. A light lunch will be served at 2:00pm outside looking out over the reserve and a waterhole. Meet your ranger again and the adventure into the Afrcan bust continues. Depart on the 3 hour afternoon evening game drive, stop in the bush for sundowners watching the splendour of the African sun setting over the mountains. Drinks are accompanied by snacks and some South African specialties. After the sun set stop the drive is continued with the aid of spot lights looking for any animals not yet spotted. Returning after your adventure to the lodge, for a delicious dinner under the African sky. Start the day with a cup of coffee followed by an early morning game drive, returning to the lodge for a healthy breakfast. After breakfast, check out and your ranger will drive you to the reserve gate. you do have the option of flying back to Johannesburg from Hoedspruit, the flight gets to JNB at 3:15pm. Overnight at the Metcourt Hotel close to the airport. After an early breakfast the hotel will transfer you to Johannesburg Airport by 08h30 in time to check in for a flight to Livingstone - Zambia. Arrive at Livingstone Airport at 13h45. You will be met by our representative and transferred to the three star Zambezi Sun Hotel, it is a 30 minute drive. 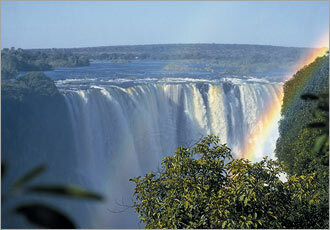 After a welcome drink and check in you will have time to relax and visit the awesome Victoria Falls. Late afternoon meet the transport in front of the hotel and they will drive you to the launch site for the sunset cruise. Enjoy the scenic beauty of the Zambezi River as you cruise slowly upstream keeping your eye open for elephants and hippos. Watch the sun set before returning to the launch site and then get the transfer back to the Zambezi Sun. End the day off with a dinner. Enjoy breakfast and then go to the Falls Centre to depart on one of the many activities available from the hotel. These include river rafting, bungee jumping, helicopter flights, micro-light flights, river cruises, canoe safaris, elephant and horseback safaris, jet boat river safaris and fishing. (These activities are optional and excluded from tour cost, it is better to pre-book extra activities). After a busy day for the adrenaline junkies or a relaxing day (for the not so adventurous) visiting the Victoria Falls, enjoy dinner at one of the restaurants. Enjoy a hearty breakfast and time for one last visit to the Victoria Falls. Transfer to Livingstone Airport in time for the13h45 flight. Arriving in Johannesburg at 15h15. This will be in time for your international flight home or a connecting flight to Cape Town. For any of the above tours AND more please enquire here. Meet and greet on arrival and transfer to the hotel. 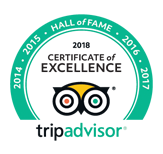 Two night’s bed & breakfast accommodation in 3 Star Hotel near the airport. GO SAfari road transfers from Johannesburg to the game lodge. Three night’s luxury accommodation at a 4 star game lodge including all meals and two safari drives per day. Scheduled road transfer from the lodge to Johannesburg Airport with Ashtons Shuttles. Economy class flight from JNB to Livingstone (Zambia). Transfers in Zambia between the airport and the Zambezi Sun Hotel. Two night’s accommodation at the 4 star Zambezi Sun Hotel. 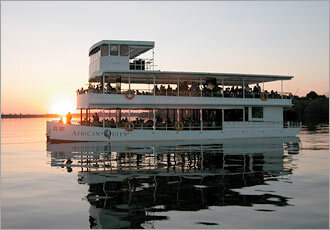 A sun set Cruise on the Zambezi River. Return economy class flight from Livingstone to Johannesburg. VAT @ 14% and tourism levies. Full Itinerary, and information; banking, preparation & processing fees. Domestic flight between Hoedspruit and Johannesburg – as an option. All other activities at Vic Falls. Telephone calls, items of a personal nature, side excursion & anything not noted. 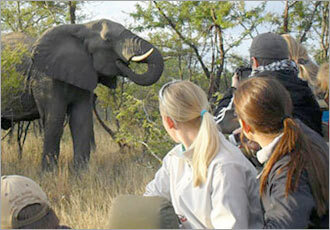 Let GO SAfari arrange this 8 Day holiday for you! Victoria Falls also known as "Mosi oa-Tunya" ("the smoke that thunders") is positioned almost exactly half way along the mighty Zambezi River's 2700 km journey from it's source to the sea. Here the river plunges headlong into a 100m vertical chasm spanning the full one-and-a-half kilometre width of the river. Creating the biggest curtain of falling water in the world and also one of the seven natural wonders of the world. The power of the falls is awesome with the highest ever flow recorded in 1958 when it reached more than 700 000 cubic meters of water a minute. The water in the gorges rose 18 metres (60 feet) above its normal flood level. This constant pounding by the currents of the mighty Zambezi has, over the millennium, cut through the rock faults and fissures and carved out not one but eight successive precipices (and now the ninth has begun). 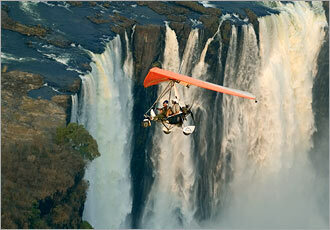 Victoria Falls is approximately 1700m wide, and varies in height from 80-108 meters. It’s one and a half times wider than Niagara Falls and is twice the height making it the biggest curtain of water in the world. Around mid-April is when peak flood waters occur. Roughly 625 million litres of water flow over the edge per minute. This huge volume of water produces a spray that rises up to 1650 feet into the air.